Just as sleep is necessary for our body similarly holidays are important for relaxation and change – they provide relief from the monotony of our daily routine. They are important for our mental and emotional well being.Holidays! Holidays! Holidays who does not wait for them? Holidays give us a break from our routine and help us to refresh ourselves and go back to work with renewed energy. Yeah summer vacation is here and the kids are uncontrollable- jump up and down with delight giving me creeps. Time for me to spend more time in my kitchen. 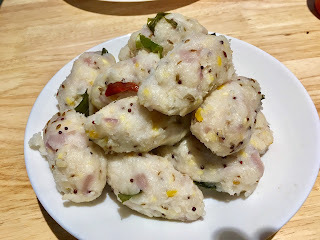 My kids happens to love these soft savory rice dumpling steamed and it's the right moment to prepare. Kara Kollukattaiis one of the popular tiffin items in most South Indian household. These are nothing but steamed rice or rava dumplings. They taste great with sambar and chutney.Kara Kollukattai is made using par boiled rice and not the regularly used rice flour. 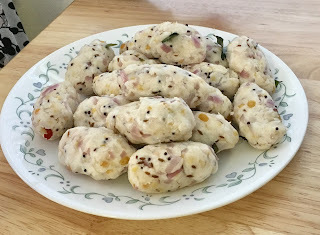 This is a very light and super tasty kollukattai. This is a childhood favorite for everyone . It's usually made during Vinayaga Chaturti- traditional Hindu festival celebrated by many in India. Add 1 cup water to the rice and grind to a coarse paste. 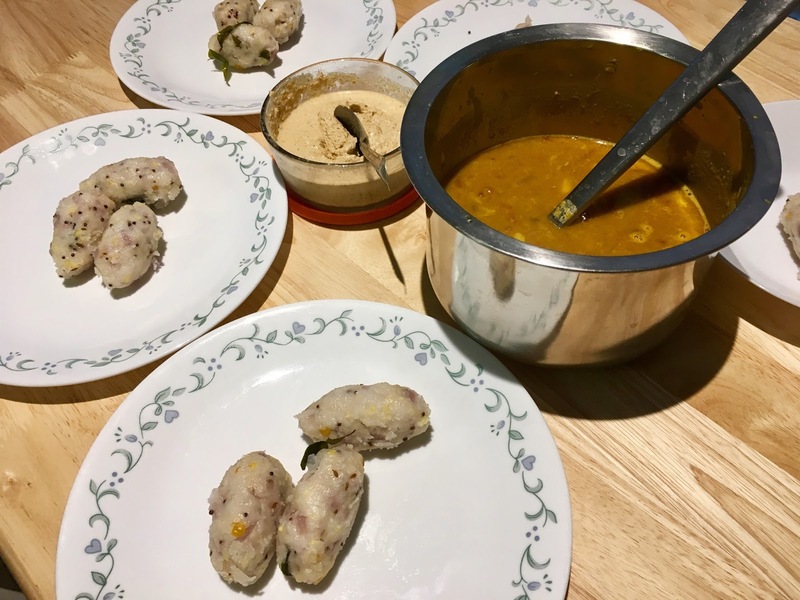 Add couple spoons of oil to a pan and splutter mustard seeds followed by cumin seeds, dried chillies, curry leaves, urad dal, chanan dal, soaked moong dal. Sauté the ingredients well for 5 minutes. Add the chopped onions - sauté til crisp and browned. 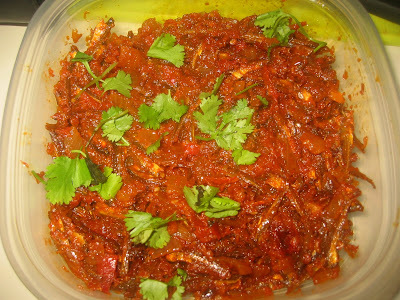 Once all ingredients mixed well add the grated coconut and give a good stir. Finally pour in the grind rice paste stirring continuously so that there are no lumps.Transfer the dough to a plate and let it cool. Let the dough become warm. When the dough is still warm, dip your hands in cold water and take a small lemon size ball of dough. Press the dough a little to form oblong shaped dumplings. Set aside. Place the dumplings on an idli plate or any flat plate and steam it for 15 minutes on a medium flame. The dumplings would become slightly glossy after steaming. 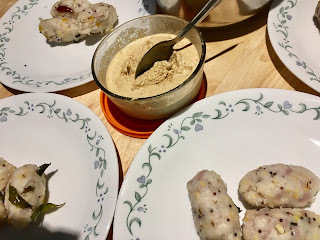 Remove from heat and service with coconut chutney . Detailed step by step video for all to try out !! !